Tod Dexter knows as much as anyone about this Peninsula and his 2011 releases were a triumph given the difficult vintage conditions that year. In 2012 the weather Gods were much kinder, indeed this looks to have been a very good vintage indeed. 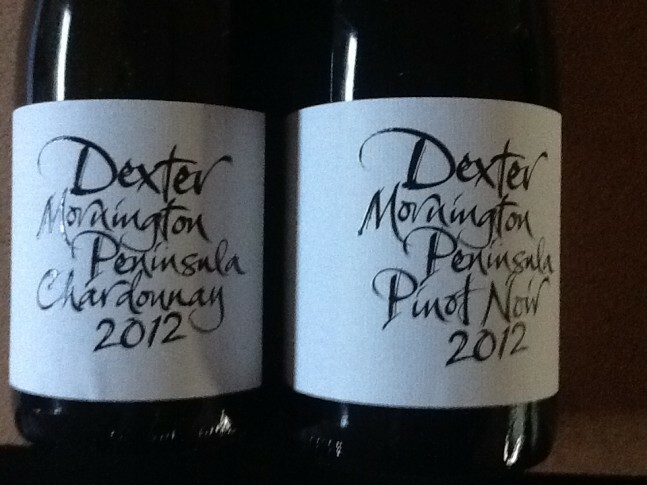 Dexter Mornington Peninsula Chardonnay 2012 is bright, pale lemon-gold, green tinged. Still a little shy to sniff, but there are hints of stone fruits. The palate is tightly contained by citrusy, grapefruity acidity, showing stone fruits, fig and its ripe and mouth-filling, held in balance by that refreshing acidity. Although there is 20% new oak, that component is background material along with suggestions of nutty, mealy complexity. This is a complex wine that wants more time; I’d suggest leaving it for another six to twelve months, from when it will repay amply that order of patience. At $A40 a bottle I recommend highly snapping up quite a few of the 7,800 bottles produced. Dexter Mornington Peninsula Pinot Noir 2012 shows medium dense plummy colour. The nose is restrained, very shy, but hints at plummy ripeness. The palate is ripe and fleshy, layered and with velvety texture. There are ripe red fruits, with a dash of spice and some charry oak. This is one of my stand out wines of this year, so good to drink now, but a shame to do so, given it can only improve in the short term. If you are tempted, decant this wine to give it time to breathe up and release its promise. This very good wine is $A55 a bottle and there were 7,600 produced. Despite their intensity and ripeness these wines are 13% and 13.5% respectively, beautifully balanced and intense. Both will repay cellaring in the short to medium term. The wines are well distributed in Australia and available in some export markets (particularly UK and USA). The website www.dexterwines.com.au has the details.